DONETSK, Ukraine -- As Ukrainian government forces close in on pro-Russia separatists' final strongholds, Western security strategists have sounded the alarm that Russian President Vladimir Putin may be preparing to invade eastern Ukraine to rescue the embattled insurgents. As shelling and gunfire exchanges between Ukrainian troops and pro-Russia gunmen close in on Donetsk, as in this residential area on Wednesday, concerns are mounting that Russian President Vladimir Putin might invade Ukraine under the pretext of aiding the Russian-speaking communities. U.S. Defense Secretary Chuck Hagel on Wednesday added his voice to the chorus of warnings that a massive Russian troop buildup on the border with Ukraine may be more than Kremlin saber-rattling. “It’s a reality, of course it is,” Hagel said during a visit to the U.S. European Command in Stuttgart, Germany. President Obama appears less worried about an imminent threat of Moscow sending troops into the sovereign territory of its former Soviet sister republic. "We're not there yet," Obama said at a news conference in Washington, contending that sanctions against Russia "are working as intended" to deter further aggression against Ukraine. The Russian economy has "ground to a halt," Obama said, as Putin faces a clear choice between peace and aggression. But the view from Russia's periphery is more unsettling. On Tuesday, Polish Foreign Minister Radoslaw Sikorski said the movement of Russian troops, tanks, armored vehicles and war planes to Ukraine's border signaled a substantial heightening of tensions and risk of invasion. "You do such things either to exert pressure or to enter," Sikorski said, citing indications that Russian forces might be deployed across the border under the pretext of providing humanitarian aid to the largely Russian-speaking population in the embattled Donetsk and Luhansk regions. More than half of Luhansk city's population has fled the fighting and chaos, U.N. refugee officials report, and many of the remaining 250,000 are without water, electricity or communications. 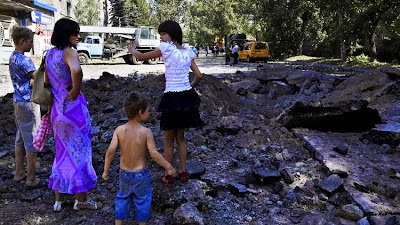 In Donetsk, a city of 1 million residents before the conflict, an encroaching government offensive to recover control has exposed civilians as well as the gunmen to artillery barrages and crossfire. The separatists, who Ukraine's government numbers at 15,000 and accuses Moscow of arming and instigating, have in the past month lost more than half of the territory they seized in the spring in a rebellion aimed at getting Russia to annex the area, as occurred with Ukraine's Crimea region in March. In the volatile days since the July 17 shootdown of a Malaysia Airlines passenger jet over separatist-held eastern Ukraine territory, Putin has been accused of enabling surrogate gunmen suspected of having fired the Russian-supplied missile and launch system, likely mistaking the Boeing 777 for a Ukrainian military transport. Airspace restrictions on Russian planes and new sanctions on Russian banking imposed last month have cut deeper into an economy already reeling, raising fears that Putin may now feel he has little to lose with an overt invasion to come to the aid of embattled allies in eastern Ukraine. Some security analysts, including senior NATO officials, express mounting concern that the Russian force poised across the border poses at least the potential for an invasion. "The latest Russian military buildup further escalates the situation and undermines efforts aimed at finding a diplomatic solution to the crisis, said NATO spokeswoman Oana Lungescu. "This is a dangerous situation." Other analysts point out that Putin would be taking on a no-win situation with an invasion, as Ukraine's military forces have improved significantly since the onset of the pro-Russia rebellion five months ago with the election of a new president and receipt of foreign aid and equipment. "The worst fears of Putin are becoming a reality and his reaction is difficult to predict and could be one of desperation," said Igor Sutyagin, Russian studies research fellow at Britain's Royal United Services Institute. But Sutyagin believes Putin is wise enough to know that invading Ukraine even with 40,000 troops and superior armor and war planes would confront the Kremlin with an unwinnable war with heavy tolls among Russian soldiers as well as the economy and Russia's international standing. "This deployment has a very substantial domestic part, and it is terribly important for Putin not to be seen as a loser," Sutyagin says of the expectations of Russian nationalists that the Kremlin will defend Russian interests abroad. Putin's approval ratings have soared since the seizure and annexation of Crimea, with 85% of those asked by pollsters cheering the Kremlin leader's campaign to bolster Russia's clout in the world. With complete control of the media and the sting of international sanctions focusing Russians' attention on their own difficulties, the analyst said, "it's possible to sell to the Russian public the scenario that unfortunately our brothers died in their fight for our interests in eastern Ukraine but we are confronting the united opposition of two powerful camps, the United States and the European Union." Blaming whatever fate befalls the separatists on the Western adversaries can be presented by the Kremlin propaganda machine as putting a priority on the needs of Russians in Russia, Sutyagin said in describing how he believes Putin will finesse a necessary "tactical retreat." "You can invade, but what do you do next? You cannot control what happens in Ukraine after that as the government forces are very different now and there is no prospect of immediate gains. There are no rational excuses for invading," said Sutyagin. That said, Russian and Western analysts predicted an 11th-hour backing down over Crimea when Russian troops invaded in February, an illegal land-grab that brought international condemnation but no effective intervention to restore Ukrainian sovereignty. "Keep in mind that Putin is acting in desperation," Sutyagin noted. "It can't be excluded that he might make a desperate move." Russia should let Ukraine to take care of its own problems. Every body knows Russia did all it can to support the separatists. But war with Ukraine would be a suicidal decision for Russia.